I have to say, I wasn’t expecting a heck of a lot from Me Va Me, and so its level of quality was actually a pretty delightful surprise. They have a decent amount of stuff on their menu, but I homed in on their laffa wraps. I had a pretty great experience at Dr. Laffa a few months ago, so I was hoping for more of the same. 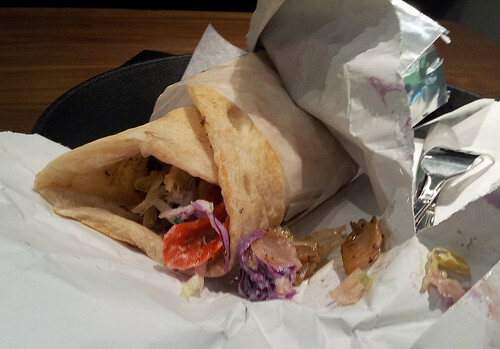 They have a few different wraps on the menu, including the mysterious Jerusalem Mix. There’s no mention of what this is anywhere on the menu, so I asked: it’s a mixture of chicken liver, heart, thigh, and sauteed onions. it’s hard to tell from my shoddy picture, but this thing is crammed to the gills with stuff. They give you a very, very generous amount of meat, and cram a ton of other stuff in there as well (the usual assortment of pickles, veggies, and sauces). I asked for everything except for onions, because raw onions are the worst and no one will ever be able to convince me otherwise. Again, you can’t tell from my terrible picture, but this thing has heft. It’s about the size and weight of a newborn baby: those with smaller appetites are advised to share. I was getting worried that it was going to turn out to be overstuffed, but somehow, all the various flavours worked perfectly together. Foremost were the various chicken bits that make up the Jerusalem Mix. Seriously good. It was perfectly cooked, with the juicy thigh pieces working perfectly with the liver. I like liver, but even if you don’t, the flavour is mellowed out by the sauteed onions and all the the other stuff. I’m not entirely sure that the heart was necessary — there were a few vaguely rubbery pieces that I’m assuming were heart. Still, tasty stuff. I don’t think the laffa itself was quite as good as the one from Dr. Laffa, which was amazingly fresh and close to perfection. But taking the whole package into account, I’ve gotta give the edge to Me Va Me. All the stuff they mix in there worked really well, and the chicken itself was above average.